Most often found on dogs and cats, fleas, which are small parasites, feed off blood from both animals and humans. Fleas are common household pests, making flea control a popular and important service that we provide Knockout Pest Control clients. Impervious to pesticides, flea eggs can lay dormant for up to a full year, hatching when they are in the presence of carbon dioxide and heat, indicators that they will find a host nearby. Flea control is difficult not only because of the flea’s resistance to insecticide, but because fleas are able to lay hundreds of eggs at once. The typical flea infestation that our flea and tick control technicians encounter breaks down like this: 50% flea eggs; 35% flea larvae; 10% cocoons; 5% adults. This means that the fleas that you are seeing and feeling in your home only account for a small percentage of the infestation. I Don’t Have Pets, How Can I Have Fleas in My Home? As our flea and tick control technicians will tell you, you don’t need to have a dog or cat in your house to have a flea infestation. Fleas can enter your home on the bodies of rodents, rabbits and birds that have come into your yard. If you are noticing irritating bites, even if you do not have pets in your house, you may have a flea infestation. 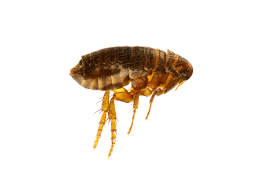 Contact us for flea control service right away, before the infestation gets out of control. Flea bites are annoying, but these common household pests carry more dangerous health risks than bites. Fleas can carry blood-borne illnesses like typhus and Bubonic Plague, and pass them on to you from their bites. Fleas can also carry tapeworms, making immediate flea pest control services necessary. We encourage all of our flea control clients to follow a specific process before we come over to perform flea control services. Before the flea service treatment can begin, clients need to pick up all clutter and toys from floors. Then, we instruct you to vacuum the entire house within one hour of flea control service and to empty vacuum bags or canisters outside of the house immediately after you have finished vacuuming. Vacuuming creates the heat and movement that cause flea eggs to hatch, meaning that they will be exposed to flea control treatment prior to maturing enough to lay new eggs. If you do have a pet, make sure that the pet undergoes flea treatment at the same time we treat your home for the flea infestation and wash all the pet’s bedding in hot water. When our flea control technicians come into your home, they quickly identify the flea source and take strategic action for pest control. As a next step, flea control technicians treat both the inside and the outside of your home. If follow-up treatment for fleas is necessary, and it sometimes is, we will perform a re-treatment within 30 days or less of the initial flea service treatment. Knockout Pest Control offers nontoxic flea control to help keep your home, family and pets safe while freeing your property of dangerous household pests. Unlike most of our pest control services, flea control service is a single treatment service followed by a follow-up service to confirm that your home is free of flea eggs. Flea service treatment does not require ongoing monthly or quarterly maintenance because of the ways fleas spread and how we eliminate fleas from your home.